27 March 1917-15 March 1918: Entered Army service as a War Volunteer, later Fahnenjunker in the Royal Bavarian 8. Feldartillerie-Regiment Prinz Heinrich von Preußen. 15 March 1918-11 August 1918: Transferred to the Bavarian 8th Field Artillery Regiment in the field. 11 August 1918-2 January 1919: Badly wounded/in War Hospital in Kortrik. 2 January 1919-16 April 1919: Transferred to the Replacement Battalion of the Bavarian 8th Field Artillery Regiment. 1 October 1919-1 October 1920: Transferred to Reichswehr Artillery Regiment 24. 1 October 1920-1 November 1922: Transferred to Transport Battalion 7. 15 January 1921-15 June 1921: Detached to the Sports School in Wünsdorf. 1 November 1922-1 October 1924: Transferred to the Division Medical Battalion 7. 1 October 1923-30 September 1924: Detached to the Artillery School in Jüterbog. 1 October 1924-1 October 1928: Transferred to Artillery Regiment 7. 1 March 1928-1 October 1928: Detached to the staff of the III. Battalion of Artillery Regiment 7. 1 October 1928-1 October 1930: Transferred to the 8th Battery of Artillery Regiment 7 and detached as an Instructor at the Artillery School in Hannover. 1 October 1930-1 October 1931: Transferred to the 7th Battery of Artillery Regiment 7. 1 October 1931-1 October 1933: Transferred to the staff of Group Command 2 and detached to the staff of the 6th Division. 1 October 1933-1 May 1934: Officer for Special Employment with the Chief of the Army Command, detached to the Officers Courses (War Academy). 1 May 1934-1 July 1935: Transferred to the Army Training Department, Reich Defense Ministry, from 21 May 1935, Reich War Ministry. 1 July 1935-12 October 1937: Transferred to Department 4 of the Army General Staff. 12 October 1937-15 June 1938: Battery Chief in Artillery Regiment 27. 15 February 1941-6 March 1941: Führer Reserve in the Army High Command. 24 April 1942-1 November 1943: Chief of the General Staff of the XXXXIII Army Corps on the Eastern Front. 10 January 1943-15 January 1943: At the same time, delegated with the leadership of the 267th Infantry Division on the Eastern Front. 15 July 1943-15 August 1943: At the same time, delegated with the leadership of the 205th Infantry Division on the Eastern Front. 1 November 1943-10 February 1944: Chief of the General Staff of the XXVIII Army Corps on the Eastern Front. 1 March 1944-3 May 1944: Führer Reserve in the Army High Command. 17 April 1944-2 May 1944: At the same time, detached to the 15th Regimental Leadership Course. 3 May 1944-8 July 1944: Commander of Grenadier Regiment 320 of the 212th Infantry Division on the Eastern Front. 8 July 1944-15 July 1944: Führer Reserve in the Army High Command. 1 October 1944-25 March 1945: Commander of the 56th Infantry Division on the Eastern Front. 25 March 1945-3 April 1945: Führer Reserve in the Army High Command. 3 April 1945-13 April 1945: Commander of Infantry Division “Ulrich von Hutten” in Germany. 13 April 1945-19 April 1945: Führer Reserve in the Army High Command. 19 April 1945-3 May 1945: Commander of the 5th Jäger Division on the Eastern Front. 3 May 1945-17 May 1948: Prisoner of war in British captivity. Knight’s Cross of the Iron Cross: 27 July 1944, Oberst i.G., Commander of Grenadier Regiment 320. Oakleaves (No. 746): 19 February 1945, Generalmajor, Commander of the 56th Infantry Division. Iron Cross, 1st Class (1939): 24 October 1939. Prussian Iron Cross, 2nd Class (1914): 26 August 1918. 1939 Bar to the Prussian Iron Cross, 2nd Class: 24 September 1939. Medal for the Winter Campaign in Russia 1941/1942 (“East Medal”): 15 June 1942. Wound Badge in Black – World War I award: 29 September 1924. 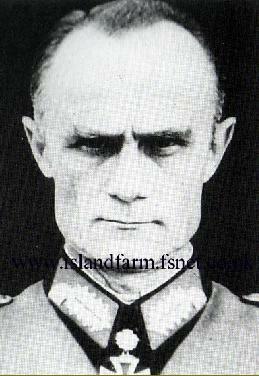 Click here to see a photo of Generalleutnant Edmund Blaurock in the company of fellow prisoners of war at Island Farm.